Special Offers 2019 / 2020 - offers and special deals. We share our special offers to help you stretch your safari holiday budget that little bit further. Our aim is to help you build a safari holiday that not only suits your personal interests but also matches your budget, so our special offers can come in very handy. When we start working on your trip we’ll add any relevant current promotions to your itinerary, helping you get the best value possible for your money. There are some brilliant deals posted here for safari lodges and hotels in Africa. These range from getting one night completely free if you spend two or three nights in certain safari lodges to excellent deals or extra nights in 5* city hotels. The offers are quite often seasonal or available for a limited time only, so if you see one that catches your eye it’s best to snap it up. Equally, please do keep checking back for new deals and promotions or sign up to our newsletter. Below, you can see all of the promotions currently running or browse through our most popular offers right now. If you would like to know about all the available offers that might work with your safari holiday, please do give us a call and we’ll discuss the options together. Alternatively, you can send in a web form enquiry and we’ll start looking into our special offers on your behalf. Please be aware that, as with all special offers, the ones featured below are only valid for restricted dates. Stay for 3 consecutive nights at Nambiti Plains Private Game Lodge in the Nambiti Private Game Reserve and save 50% on your last night. Valid: 10 July 2019 - 31 August 2019. Valid: 1 November 2019 - 15 December 2019. The bride saves 50% on her accommodation when you stay for 2 nights at Rockfig Safari Lodge in the Timbavati Game Reserve on honeymoon. Valid: 1 November 2018 - 31 December 2019. Valid for travel within 6 months of the wedding date. A valid wedding certificate must be produced on check in. Stay for 3 nights for the price of 2 at HillsNek Safaris in the Amakhala Game Reserve. Valid: 1 May 2019 - 30 June 2019. Stay for 3 nights for the price of 2 at Quatermain's Camp in the Amakhala Game Reserve. Valid: 1 May 2019 - 31 July 2019. Stay for 3 nights for the price of 2 at Thakadu River Camp in the Madikwe Game Reserve. Valid: 1 May 2019 - 30 July 2019. Stay for 3 nights for the price of 2 at Nambiti Plains Private Game Lodge in the Nambiti Private Game Reserve. Stay for 3 nights for the price of 2 at Chiawa Camp in the Lower Zambezi National Park. The Park fees/Conservation Levy of USD 100 per person will be charged for the complimentary night. Stay for 3 nights for the price of 2 at Old Mondoro in the Lower Zambezi National Park. Stay for 3 nights for the price of 2 at Bukela Lodge in the Amakhala Game Reserve. Stay for 3 nights for the price of 2 at Amakhala Safari Lodge in the Amakhala Game Reserve. Stay for 3 nights for the price of 2 at Hlosi Game Lodge in the Amakhala Game Reserve. Stay for 3 nights for the price of 2 at Woodbury Lodge in the Amakhala Game Reserve. Stay for 3 nights for the price of 2 at Woodbury Tented Camp in the Amakhala Game Reserve. Stay for 3 nights for the price of 2 at Leeuwenbosch Country House in the Amakhala Game Reserve. Stay for 3 nights for the price of 2 at Amakhala Bush Lodge in the Amakhala Game Reserve. Valid: 16 October 2019 - 21 November 2019. Valid: 16 October 2019 - 14 November 2019. Valid: 1 December 2019 - 14 December 2019. Valid: 1 May 2020 - 31 July 2020. Stay 4 nights or longer and receive complimentary return transfers between the lodge and Hoedspruit Airport. Valid: 1 December 2019 - 31 March 2020. Stay for 4 nights for the price of 3 at Billy's Lodge in the Balule Nature Reserve. Valid: 1 January 2019 - 15 December 2019. Not valid for travel in August 2019. Stay for 4 nights for the price of 3 at Makanyi Private Game Lodge in the Timbavati Game Reserve. Valid: 4 January 2019 - 19 December 2019. Stay for 4 nights for the price of 3 at Marataba Trails Lodge in the The Waterberg. Valid: 4 January 2019 - 30 April 2019. Stay for 4 nights for the price of 3 at Beho Beho in the Selous Game Reserve. Valid: 5 January 2019 - 20 December 2019. The Park fee and Concession fee are not included. Stay for 4 nights for the price of 3 at Serengeti Bushtops in the The Serengeti. Valid: 6 January 2019 - 22 April 2019. Park fee, Concession fee and TDL are not included for the free night. 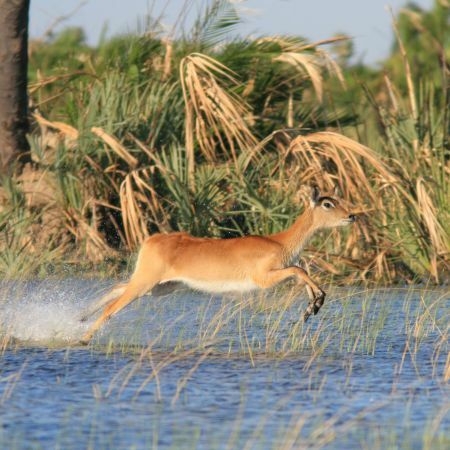 Stay for 4 nights for the price of 3 at Duba Plains in the Okavango Delta. Valid: 11 January 2019 - 31 May 2019. Free night includes accommodation only - the Conservation fee is payable on the free night. Stay for 4 nights for the price of 3 at at Zarafa Camp in the Selinda. Stay for 4 nights for the price of 3 at Selinda Explorers Camp in the Selinda. Stay for 4 nights for the price of 3 at Duba Explorers Camp in the Okavango Delta. Stay for 4 nights for the price of 3 at The Retreat Selous in the Selous Game Reserve. Valid: 11 January 2019 - 15 December 2019. The Park fee and Conservation fee are not included. Stay for 4 nights for the price of 3 at Chitwa Chitwa Game Lodge in the Sabi Sand Game Reserve. Valid: 15 January 2019 - 15 December 2019.